Anvil rollover clouds, considered the slang for Cumululiform Anvil clouds, are some of the interesting cloud formations you see on the sky. But what makes these clouds fascinating? How does the anvil rollover cloud differ from the other varieties of clouds? What kind of weather does it bring? Read further to learn the answers. Anvil rollover clouds are special cloud formations that have distinctive globular projections attached to the bottom of anvil clouds. They are visible on the area where the anvil cloud spreads against the direction of the wind due to extremely strong thunderstorm updraft. Although anvil clouds are often associated with mammatus clouds, the anvil rollover cloud is not a mammatus cloud. Mammatus clouds are characterized by hanging pouch-like formations due to sinking air while anvil rollover clouds are distinguished by their rollover cloud formations caused by strong updrafts. What do Anvil Rollover Clouds Look Like? Anvil rollover clouds resemble cumulus clouds but with fibrous appearance. Because of the intense thunderstorm updraft, they may appear like bumpy projections on the edges and base of anvil clouds. When you see anvil rollover cloud formations developing alongside large cumulonimbus clouds, it signifies high winds, heavy rainfall, thunder and lightning. How is Anvil Rollover Clouds Formed? Anvil rollover clouds are formed by the rapidly spreading thunderstorm updraft. To fully understand anvil rollover cloud formation, let’s first consider how anvil clouds develop. 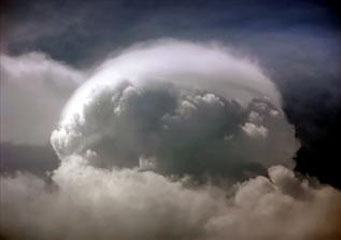 The anvil cloud is an accessory cloud found on top of a cumulonimbus cloud. It develops when the rising warm air (or updraft) expands horizontally as a result of temperature inversion at the base of the stratosphere which prevents the updraft from rising farther. When thunderstorm updraft is extremely strong, it rapidly and steeply spreads horizontally against the wind flow resulting to the formation of anvil rollover clouds. At What height are Anvil Rollover Clouds found? Anvil rollover clouds develop at the tropopause, the boundary region between the troposphere and the stratosphere. The height of the tropopause depends on several factors like season, latitude and whether it is daytime or nighttime. In tropical countries, the tropopause is found about 65,000 feet above the ground, and at 23,000 feet from the surface in polar regions. It is found approximately 50,000 feet up in the atmosphere in Mid-latitude regions. As a general rule, when anvil rollover clouds develop at higher altitudes, they signify severe weather conditions. This is especially true when you notice anvil rollover clouds in the sky which appear due to very strong thunderstorm updraft. How common are Anvil Rollover Clouds? Anvil rollover clouds are common sightings whenever there is an upcoming strong thunderstorm during the summer and spring times. They are often visible along gust front lines in mountainous or coastal regions and occur all over the world. So when you see anvil rollover clouds in the sky, be prepared as heavy rainfall or thunderstorm is fast-approaching.